NELP takes on issues that matter to working families. We’re fighting for good jobs that pay livable wages. We’re fighting to ensure that America delivers on her promise of opportunity and economic security for all who strive to work for a better life. Workers have seen their wages stagnate or decline for more than three decades now. Lifting wages is crucial to tackling inequality and building a stronger economy. 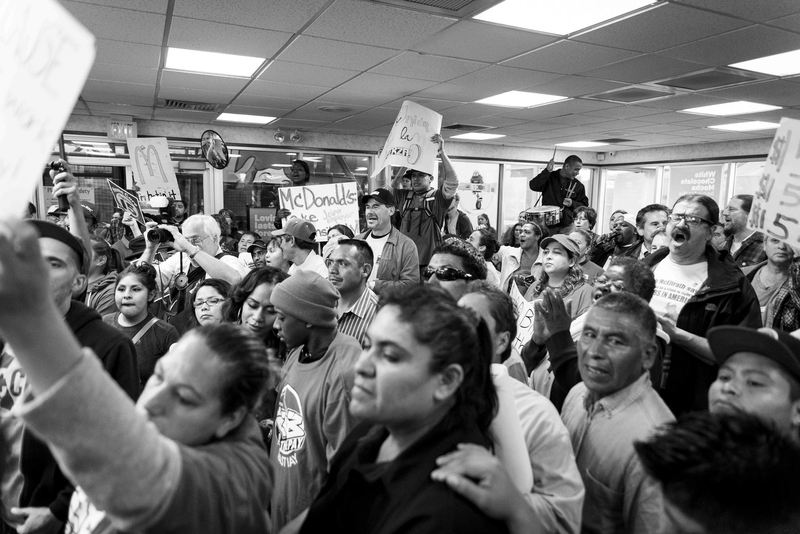 NELP is leading the charge to raise pay for America’s low-wage workers. We spearhead the national coalition that’s working to lift up the federal wage floor. And we provide vital support and expertise to minimum wage campaigns in states and cities around the nation. Federal government spending finances millions of jobs around the nation. We believe that all jobs—especially if they’re supported by taxpayer dollars—should be good jobs. NELP partners with allies to promote reforms that require federal contractors to provide good wages and benefits. NELP also works with local partners to enact and strengthen living-wage laws that attach higher wage standards to projects that receive taxpayer-funded subsidies. An estimated 70 million Americans have an arrest or conviction record that often makes it much harder to find work. Persistent joblessness translates into economic and social losses for everyone. NELP is fighting to reduce hiring barriers faced by qualified job-seekers with records so that everyone has a fair chance at a job. Although the economy is steadily improving, millions of Americans remain long-term unemployed, and many have lost hope after facing hiring discrimination and other barriers to employment. NELP is committed to advancing reemployment policies and programs that help long-term jobless workers return to the workforce and prevent long-term unemployment in the first place. Today, just over one in four unemployed workers receives jobless aid—a record low. Cuts to state jobless aid and the loss of federal extended benefits are largely to blame. So too are outdated eligibility rules that exclude many lower-wage workers, and dysfunctional application systems that pose needless barriers to access. NELP is working to restore and strengthen programs to help the jobless. We’re fighting to ensure that these vital programs are responsibly financed so that they’ll be there when the next cyclical downturn hits. NELP is working to strengthen safety and health protections for low-wage workers by fighting for improved safety and health standards and workers’ compensation laws, advocating for robust enforcement of safety and anti-retaliation protections in low wage industries, and building effective campaigns to hold low wage employers accountable. NELP is committed to improving wages and working conditions for the millions of home care workers and domestic workers in the United States. We’re a lead partner in the effort to ensure that home care workers, after 40 years of exclusion, are finally protected under our nation’s minimum wage and overtime laws. And we’re working to strengthen workplace rights for domestic workers, for example, by supporting campaigns to enact Domestic Workers’ Bills of Rights in states around the nation. Each year, millions of America’s workers—from restaurant, retail, and domestic workers to janitors, day laborers, and many others—are cheated out of the wages they’ve earned when unscrupulous employers fail to pay minimum wage or overtime, withhold tips, or require them to work off the clock. NELP works with allies to fight wage theft and strengthen the enforcement of core labor standards. We bring our legal and policy expertise to work with state and local partners to design and implement robust enforcement policies and systems. Employer outsourcing of labor can suppress wages and permit evasion of responsibility for basic worker protections. Too many companies use multi-level subcontracting, temp or staffing firms, franchising, and independent contractor misclassification to evade the legal obligations owed to employees. NELP is working to stop abusive outsourcing practices. Through strategies such as expanding the use of joint-employer responsibility, we seek to restore accountability so that workers who suffer abuse at work will have recourse against those at the top who effectively control and ultimately profit from their labor. Immigrant workers fill some of the most dangerous and poorly paid jobs in America. They also are among the most vulnerable to abuse on the job, especially if their presence in the country is not secure. NELP advocates for a strong firewall between immigration enforcement and the enforcement of workplace rights, as well as state and federal protections against retaliation, so that all immigrant workers can enforce their labor rights in a climate free of fear. Many workers are struggling to cobble together a living in jobs that offer too few hours on too short notice. NELP is working with local and national allies to ensure that these workers have stable hours and predictable schedules that allow them to pay their bills, plan their lives, and care for loved ones.